LE MYST SPECTACULAR PENTHOUSE WITH OVERSIZED TERRACE OVERLOOKING CITY, CANAL, MOUNTAIN Stunning LVG/DNR/Kitchen adj. stunning terrace w/Summer kitchen,gas fireplace,BBQ,stunning sunsets for perfect Summer nights.3 BDRMs including master suite+walk-in+ensuite,2 full baths w/tubs+showers,gourmet kitchen (gas),walk-in pantry,cellier,PWDR,2 garages. 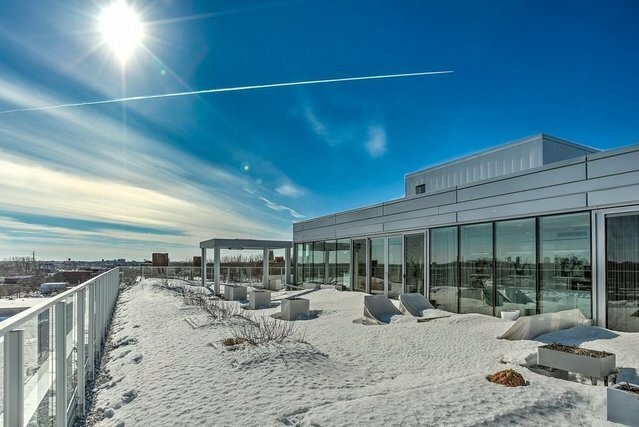 ADDENDUM: THE MYST - prestigious address offering a unique * Stunning views of the City, Lachine Canal & the mountain. * Modern functional kitchen with gas cooktop, cellier,built-ins+over-sized kitchen counter., walk-in pantry + adjacent Laundry room. * Sonos & 'Lutron' lighting systems. * All bedrooms have walk-in closets. * Private master suite with ensuite, large walk-in closet & access to the terrace. * Two full bathrooms both with separate showers, bathtubs and double sinks. lifestyle, 5-star amenities for the discriminating Buyer ! * Beautiful staircase. * Two indoor garage spaces (possibility to add electric car charger). * Storage locker S-2 #D09 * Central heat & air conditioning * Heated pool, spa, sauna, gym, lounge area & reception room. * Alarm system 'Microtec Securite' - $32.18/month. NEAR : * All services, trendy addresses, shops, restaurants * Lachine Canal & Atwater Market * Metro Charlevoix is just a few steps away * Bike paths all along the canal RENTALS: * No short-term rental, no Airbnb. CONDO FEES: * Condo fees include: partial heating costs, A/C & hot PENTHOUSE 604: water. * GARAGES: P-2 #64, #65. * MUNICIPAL EVALUATION (2019): Condo: Land 130,300$ Building 1,024,700$ Total 1,155,000$ Garage S-2, #64: Land 5,400$ Building 39,200$ Total 44,600$ Garage S-2, #65: Land 5,400$ Building 39,200$ Total * MUNICPAL TAXES (2019): Condo: 10,122.44$ Garage S-2 #64: $390.89 Garage S-2 #65: $390.89 * SCHOOL TAXES (2018-2019): Condo: 2,001. $58 Garage S-2 #64: $34.42 * Exceptional living area filled with natural light & Garage S-2 #65: $34.42 * The taxes & evaluation on the listing include the condo and the two (2) garage spaces. * No Air BnB impeccable finishings. * Stunning white oak flooring throughout. * Wall-to-wall, floor to ceiling windows on two sides.